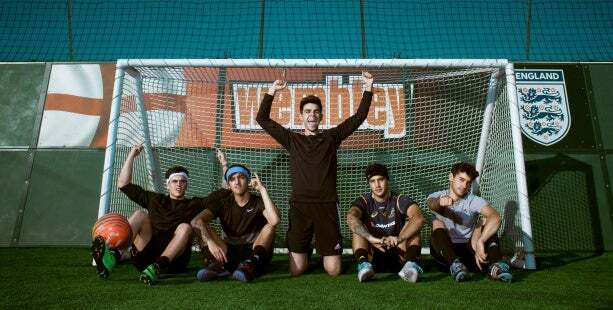 Janoskians - Janofest - One Night Only! Under 14s need to be accompanied by adult 16+. Please don’t queue up overnight – there are no facilities and you will be moved on by Wembley Park security. Also – all tickets are seated – so you have an allocated seat. Only ticket holders will be allowed access to the building. There isn’t a waiting area, though the London Designer Outlet centre is open next door with lots of great shops and restaurants. Melbourne-born masters of ‘social disturbance’ and new punk mischief makers, THE JANOSKIANS, are taking over The SSE Arena, Wembley on Saturday March 21st. Following the success of their second sold-out worldwide ‘Got Cake’ tour last year, the boys will embark on a huge date here with support from pop rap duo Jack and Jack. With pandemonium and fanfare growing exponentially worldwide, THE JANOSKIANS have joined forces with LIONSGATE® for the development and future release of a feature length film based on their one-of-a-kind brand of "social disturbance comedy". The film, helmed by Danny Lee [Road to Brooklyn, Detroit Rubber] and penned by comedian Dan Ahdoot [Super Fun Night, Your Pretty Face Is Going to Hell, Kickin' It], will encompass a partially-scripted comedy packed with stunts, public pranks, wish-fulfillment and hilarity as we follow the Janoskians adjusting to life in Los Angeles and vowing to throw the most epic party of all time. And with their record deal with Republic Records, new music is only round the corner! For the unfamiliar, in 2011, JANOSKIANS mayhem started brewing when the group uploaded their first ‘Awkward Train Situations’ video to YouTube. As the fan base grew, they continually released hilarious and disruptive content, gaining over 1.79 million YouTube subscribers and counting as well as accruing more than 137 million combined views. They later shut down the world renowned Beverly Center in L.A. as thousands of girls flooded the mall. Meanwhile, an appearance in Times Square in February 2014 drew 20,000 fans.